Brain tumors are the most common solid tumors that occur in children. Children of any age can be affected by this tumour. Today, more than half of all children diagnosed with a brain tumor will be cured of the disease. However, because of their location, the treatment for brain tumors is particularly complex. Furthermore, many children who are treated for brain tumors experience significant long-term problems, such as changes in intellectual and motor function. Consequently, these children require ongoing assessment and specialized care to help them function at school and throughout life as best as possible. The central nervous system (CNS) consists of the brain and spinal cord .Together they control all our body functions. 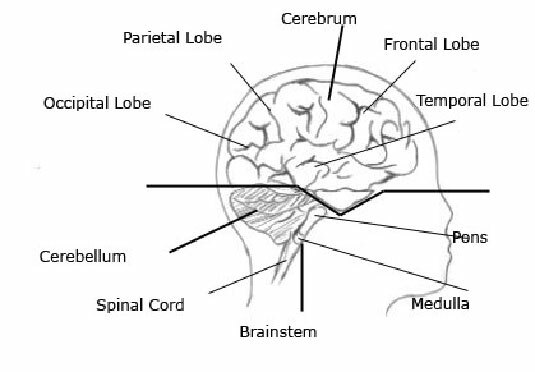 Between the brain and the skull are three layers of membrane called meninges which completely covers the brain and spinal cord. A fluid called the cerebrospinal fluid (CSF) is contained between two of these layers and cushions the brain. This fluid is made in small hollows within the brain, called ventricles. The brain is connected to the face by twelve specific cranial nerves that control most eye, face and tongue movements. The brain, like every other organ in the body is made up of cells. There are about 40 billion nerve cells, called neurons in the brain. These cells communicate with each other and with other parts of the body by sending messages or nerve impulse via a system of nerve pathways or network. The cause of brain tumours is unknown. Children born with rare genetic syndromes (i.e. neurofibromatosis, Von Hippel-Lindau disease, Li-Fraumeni syndrome) are known to have an increased risk of developing tumors of the central nervous system. Children who have received radiation therapy to the head as part of prior treatment for other malignancies are also at an increased risk of brain tumors. Most primary brain tumours are benign, which means they tend to remain in that part of the brain in which they started and not spread to other areas or to distant sites. Complete removal of the tumor is usually a sufficient treatment. Malignant primary brain tumors are those that can spread and invade other areas, so that even if the tumor is surgically removed, other cells will grow back, continuing to invade. The classification of benign or malignant brain tumor can be very misleading. In particular, benign tumors can be fatal if they press on certain vital areas, or if they cannot be removed and continue to grow. All tumors of the central nervous system are dangerous. Symptoms vary depending on the size and location of tumor. The symptoms of a brain tumor may resemble other conditions or medical problems. Always consult your doctor for a diagnosis. There are many different types of brain tumors. The two main types that affect children are medulloblastomas and gliomas. Treatment involves a multidisciplinary approach. Treatment modalities consist of surgery, radiotherapy and chemotherapy, alone or in combination. In most cases a neurosurgeon will operate to remove as much of the tumor as possible. This will provide tissue which will be examined by the pathologist to determine the exact type of tumor. Sometimes a fine tube or shunt needs to be inserted to drain the excess cerebrospinal fluid from the brain into the lining of the abdominal cavity. This will stop further rise in intracranial pressure and relieve symptoms. If the tumor cannot be removed because it is at a dangerous site such as the brain stem, or if the excision is incomplete or if there is a chance that some cancerous cells may be left behind, then radiotherapy may be given after surgery. Chemotherapy which is the use of anti – cancer drugs to destroy the cancer cells, is used routinely to treat medulloblastoma and is increasingly used to treat other types of brain tumors. What is the long-term outcome for a child with a Brain Tumor? What kind of long-term follow-up care should be expected? Children treated for brain tumors frequently have changes in intellectual and motor function that affect their learning. Therefore the program that address their special needs which provides a variety of individualized services to ease the child’s return to school and maximize their potential to have a successful learning experience is important.